The International Finance Corporation (IFC) with Government is trying to convince hotels and resorts in Fiji to locally source fresh produce – and farmers have a role too. Hotels and resorts in Fiji spent over FJ$74 million last year buying fresh produce. Less than half (48 per cent) of that was sourced locally. This is according to an IFC-led ‘From the Farm to the Tourist’s Table’ study, launched by the Minister for Industry, Trade, Tourism, Lands and Mineral Resources Faiyaz Koya in Suva yesterday. The study was conducted on 62 hotels and resorts across Nadi, Lautoka, Denarau, the Coral Coast and the Mamanuca and Yasawa Group of Islands. Data showed that vegetables, fruits, meat, seafood and dairy remain the primary cost drivers for Fiji hotels and resorts, representing $FJ38.5m of the total expenditure bill. The study suggests the figures are progressive, given that in 2011 hotels and resorts were importing as much as 80 per cent of fresh produce. But there is still “room for improvement,” with the industry having the potential to reduce its import bill by a further $24.1m, the study says. The study recommends improving the quality of fresh produce sourced in Fiji – because nothing can ruin a holiday like food poisoning. It identified some key issues that need to be addressed before this could be achieved. For fruits and vegetables, seasonality of products and inconsistent supply were discouraging hotels from purchasing locally. For meat, hotels found the poor quality of products and a lack of adherence to safety standards off-putting. Similarly for seafood, hotels identified inconsistent supply and poor-quality products as the main reason they were opting for foreign goods. 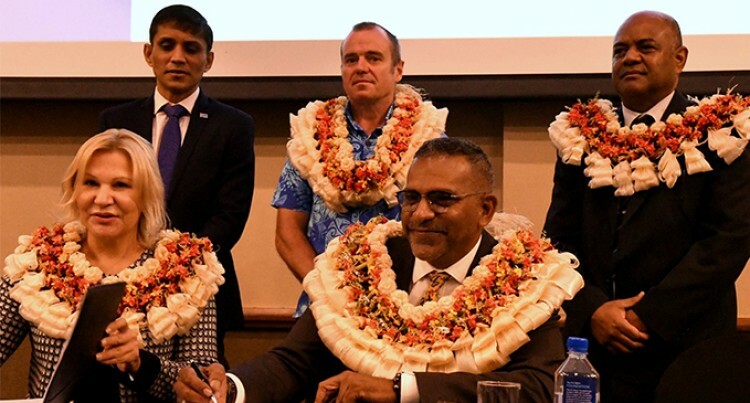 IFC is hoping the information in the study can boost the link between agriculture and tourism, Fiji’s largest Gross Domestic Product contributor. The industry also employs close to 120,000 people and is Fiji’s main foreign exchange earner. “To achieve this feat and address broader issues of sustainability, strengthening linkages and creating closer synergies between the tourism and agriculture sectors is imperative,” Mr Koya said. The decision-making role of chefs at hotels and resorts is also explored in the study. Since most chefs at big hotels are expatriates, there is often a disconnect or lack of networking between these decision makers and local suppliers, the study found. Thus, the study recommends creating pathways that can help the tourism industry and agriculture sector work together. IFC, a sister organisation of the World Bank, partnered with the Ministry of Industry, Trade and Tourism, the agricultural ministry and the Australian Government during the study. It was based on demand estimates, feedback from specialists and qualitative interviews with hotel chefs, owners and purchasing managers. The launch also saw IFC and Government enter a co-operation agreement to further strengthen their partnership, especially in the area of farmer capacity-building. “We see an opportunity to partner with the IFC in the area of capacity building for farmers, sharing market access intelligence and working on developing applications that provide hotels information on the availability of supplies.” Mr Koya said. Government’s five-year and 20-year National Development Plan (NDP) has set the goal of earning $2.2 billion as part of its 2017-2021 Fijian Tourism Development plan. Central to this goal is “strengthening linkages to the tourism industry,” alongside other ambitious plans. “Market linkages that enable the supply of local agricultural and fisheries produce to the tourism industry will be facilitated and developed.” the NDP document says.